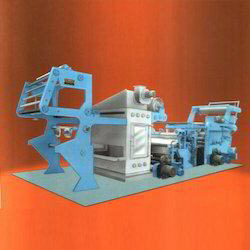 Leading Manufacturer of automatic compressive shrinking machine and compressive shrinking machine from Ahmedabad. Compressive Shrinking Machine is designed to achieve Shrinking results in accordance with international standards for the dimensional stability of fabrics, for widths up to 1200 mm - 3400 mm. It is suitable for fabrics like cotton, synthetics, blends and denims. Fabric is shrunk between the Rubber Belt and the hot mirror-polished drum by adjusting the belt stretch by acting on the pressure roller, it contracts the fabric between the rubber belt and the mirror finish heated drum and is shrunk. Shrinkage variation is obtained by varying the pressure applied to the rubber belt. Greater the pressure higher is the shrinkage. 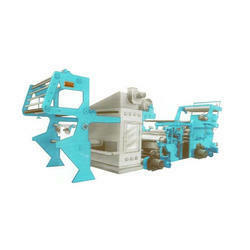 Looking for Compressive Shrinking Machine ?